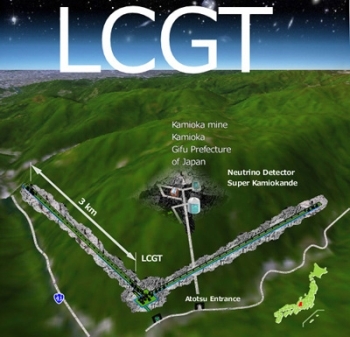 Large-scale Cryogenic Gravitational wave Telescope (LCGT) is a project that aims to achieve the first detection of gravitational waves (GW). KAGRA is designed to observe several GW events in a year. This Japanese project is hosted by ICRR, University of Tokyo with cooperation of Gravitational Wave Project Office, KEK, and various universities/ institutes in the world. This telescope is quite different from optical telescopes and radio telescopes. It is a laser interferometer which detects faint space-time distortion as described in "Detection of Gravitaional Waves". In order to increase the sensitivity of the interferometer, advanced technologies such as high-power laser source, large-aperture ultra-low loss mirrors, ultra-high vacuum equipments will be used. Here are the main features of the telescope listed. We designed the KAGRA detector to have the arm length of 3km so that it has relevance in the international competition of the first GW detection. Italy and France has a joint project Virgo with a 3-km detector. In the United States, LIGO has two 4-km detectors and a 2-km detector. GW detection is a precise distance measurement. Therefore, seismic motion can be a fundamental noise source of the detector. We have selected kamioka mine, Hida, Gifu prefecture of Japan as a seismically quiet site. The mirrors are cooled so as to reduce thermal vibration of the mirror material. 4. Sapphire is chosen for the material of the mirror. Sapphire is one of the best materials for a cryogenic GW interferometer because it has excellent optical property as well as the thermal properties at the cryogenic temperature. The above 2 to 4 are features that are seen only in the Japanese KAGRA detector. We attempt to detect the first GW signal with those unique technologies. Since KAGRA is the first large interferometer gravitational wave detector with cryogenic mirrors, it is necessary to demonstrate its feasibility. The GW group of Institute for Cosmic Ray Research has built a protype interferometer, 100-m length interferometric GW detector “CLIO” in the Kamioka mine. The TAMA300 project office is cooperating with ICRR group for the development of CLIO. In February of 2006, the detector successfully operated at cryogenic temperature with Sapphire mirrors. In November of 2008, we achieved the milestone to reduced the detector noise level to the thermal noise level at room temperature. As a next step, cooling of the mirrors are planned in order to demonstrate thermal noise reduction.